Everyone needs help from time to time. Even the experts can’t remember everything that MATLAB does, and notes go only so far in jogging the memory. So, when you need help, don’t feel as though you’re the only one seeking it. Most of the MATLAB-specific help information appears in the Resources group of the Toolstrip’s Home tab. There are also some additional ways to obtain help. Choose Help→Documentation in the Resources group of the Toolstrip’s Home tab when you want to explore the documentation in general — simply as a means of learning more about MATLAB. If you want to find something a bit more specific, you can always type search terms in the search bar that appears at the top of the Help window. As you type, MATLAB displays corresponding topics in a manner that helps you narrow the focus of your search. Type help(‘help_topic’) and press Enter in the Command window to obtain help about a specific help topic. Highlight a keyword or function name and press F1 to obtain help on that specific topic. Click links as provided in help messages, error messages, or other MATLAB output. You can access the examples that MATLAB provides by choosing Help→Examples in the Resources group of the Toolstrip’s Home tab. Peer support depends on other MATLAB users to help you. Because some other user has likely already encountered the problem you’re having, peer support is a great option. To access peer support, click the Community icon in the Resources group of the Toolstrip’s Home tab. You see your browser open to the MATLAB Central site. The content on MATLAB Central changes regularly, but you normally see links for exchanging files, answers to common questions directly from MATLAB, blogs, and a number of other useful information areas. MATLAB Central is actually the best place to find what you need. Of course, you can always search the remainder of the Internet when MATLAB Central fails to provide precisely what you want. 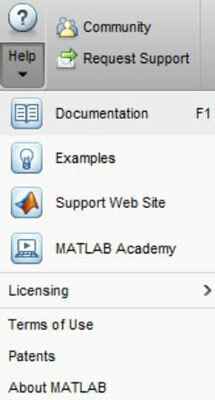 MATLAB offers courses in specific disciplines and in general usage. When you choose Help→Training in the Resources group of the Ribbon’s Home tab, MATLAB takes you to a site where you can sign up for courses. The courses come in both traditional classroom form and in online format. The online format courses are further divided into those that are led by instructors and those that are self-paced. When you have a really tough problem, one that defies any other solution, you can request help directly from MathWorks. When you click Request Support in the Resources group of the Toolstrip’s Home tab, you see a login dialog box. Simply provide your email address and MathWorks password; then follow the prompts to obtain help from MathWorks. You can also find useful MATLAB information on John Mueller’s blog. Even though there’s no troubleshooting your application, the blog can provide helpful tips for using MATLAB.